Most of us have sports teams that we enjoy watching and support in our own ways, whether it's wearing their jerseys, face painting their symbols onto our faces before a big game, placing decals on the back of our cars, or other subtle ways of showing our deep devotion. People are now taking it a bit further. A superstitious 47 year old man, Tom Anastasi, from Mays Landing, New Jersey is preparing for the Stanley Cup Finals tonight. 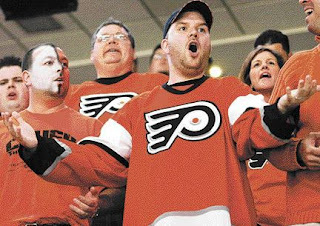 He's wearing the same jersey he wore when he experienced his first parade down Broad Street when the Flyers brought home the Cup in 1974, leaving it unwashed and full of luck. There's a great variety of other superstitions fans have, such as watching from the same place, being with the same people for game time, or sitting in the same chair. People really believe that doing these things have an impact on how their teams perform come game time. Shortly before the Eagles went against the Cardinals in 2009, Anastasi's wife asked him to put food in the bird feeder and he refused because there were cardinals feeding at the time. Fans go into a type of obsessive behavior around game time. It's not just the fans though, the players are doing their share as well. The Flyers are sporting their playoff beards. Many of them have not shaved since the beginning of the playoffs, hoping it will bring them luck. Some of the players wear the same shoes or hats everyday. For some players there are certain ways that they enter and leave the ice. For fans, it's a way to show their support and a means of making them feel like their playing a part in the outcome of the game. Sometimes the screaming and cheering just isn't enough. For the players, it's a mindset. Their rituals are various ways that they hope they can attract some luck their way. There is no correlation between the amount of goals scored and the thickness or length of the players beards. There is also no correlation between how dirty and vintage a fan's jersey is and the team's success. These superstitions are pure mindsets that allow everyone to become a little more immersed into the game. For some fans, an illusory correlation might exist, but for most, it's just a way of getting involved. Let's go Flyers! Atlantic City 9 June 2010, Atlantic County ed. : A1, A5. Print. June 2010: n. pag. Web. 9 June 2010. . I have friends that are like this with their sports teams. I am not superstitious about my favorite teams but if I am playing a sport I am very superstitious. This article was fun to read because it is ridiculous the lengths sports fans will go to "help their team win". I play hockey and occasionally I will get superstitious with what I do and say while I am playing but afterwords I realize how ridiculous it was for me to think that it would affect the outcome of the game.